We’ve already paid a lot of attention to third-party Magento 2 search options, but there are still tons of useful tools and solutions designed to make the default user experience better. So, today we will describe how to equip your store with an advanced search option by installing Amasty Product Parts Finder for Magento 2. The Magento 2 product parts finder extension provides customers with the ability to seamlessly find necessary repair parts and components by adding a bunch of additional filters. It is possible to show part finders on home and category pages, import values for finder options, add multiple selection options to each filter, and many more. Sounds intriguing, so let’s explore the module. An easy-to-use Magento 2 product parts finder is an excellent solution for every ecommerce shop, but it is especially useful for online stores selling spare details and accessories often related to cars and radio-electronics. A tiny improvement radically enhances the way your online shoppers look for the desired goods. They can choose such necessary information like year of production, model, or manufacturer and filter out a list of relevant items. As for the Magento 2 advanced search settings and features of the Amasty Magento 2 Product Parts Finder extension, they include the ability to create various filters that will be used in addition to standard layered navigation. These new filters can be more precise, providing customers with the desired goods only. For instance, the Magento 2 product parts finder module allows creating a year-make-model filter or any similar solution. You can add the newly created filters to both home and category pages providing visitors with stunning shopping experience right from their first contact with your online storefront. Besides, since each filter supports multi-select functionality, buyers can configure the list of provided results as narrow as they need. It is necessary to mention that a filter can be applied to a current category only. Thus, other categories won’t be affected. Also, note that customer specified values are saved, so after browsing your store, a visitor can return to filter page without losing previously applied parameters. Such a user-friendly Magento 2 product parts finder feature, isn’t it? Only one finder can be applied at a time. If a new finder is used, options selected in a previous one are cleared. Also, pay attention to universal products. Such products are displayed despite the selected filter parameters. The Amasty Product Parts Finder Magento 2 extension allows showing them after more relevant results. Besides, you can assign multiple products to a single filter value. 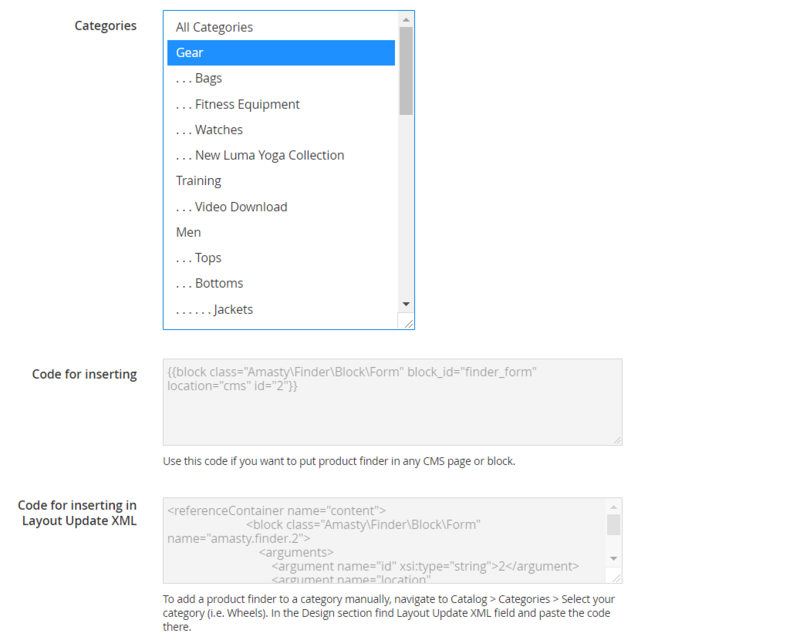 These were core features available with the Magento 2 product parts finder extension. Now, we will proceed to the backend and then to frontend section to see how the Amasty part finder works. All product parts finders are available in the grid that shows their IDs, names, and number of dropdowns. 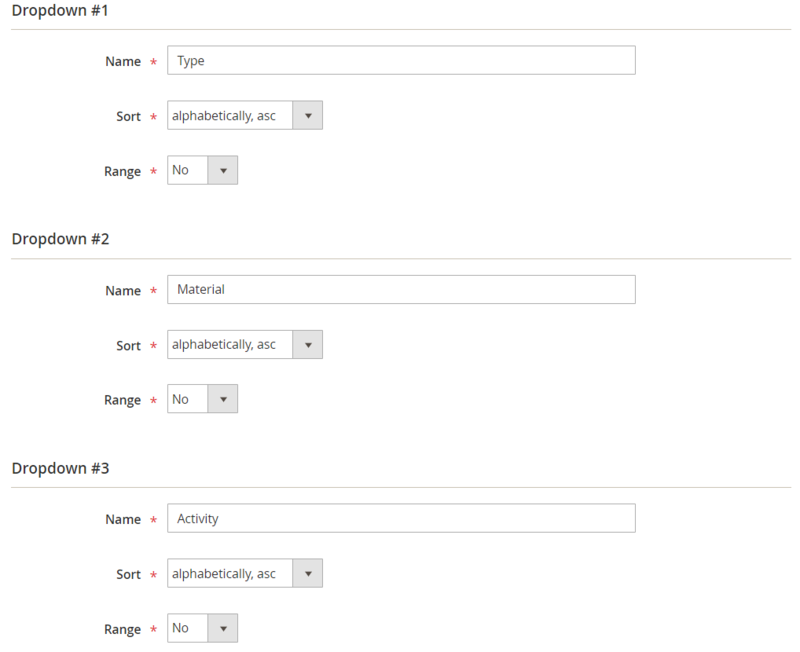 You can select items for applying mass actions, rearrange the existing order of columns, use filters, and do more. While editing an existing finder, you have to deal with 7 tabs of options: General, Dropdowns, Products, Import, Import History, Universal Products, and Universal Products Import. Below, we shed light on each Magento 2 product parts finder tab. Under the General tab, specify or edit a finder’s name, choose a template type (vertical or horizontal; leave blank to use a default solution), and enter a custom destination URL. Then, add the finder to the default category, which we recommend for proper work pf the extension on the home and CMS pages. Next, decide whether to show or hide the parts finder block on the frontend and display or not the finder on the search results page. 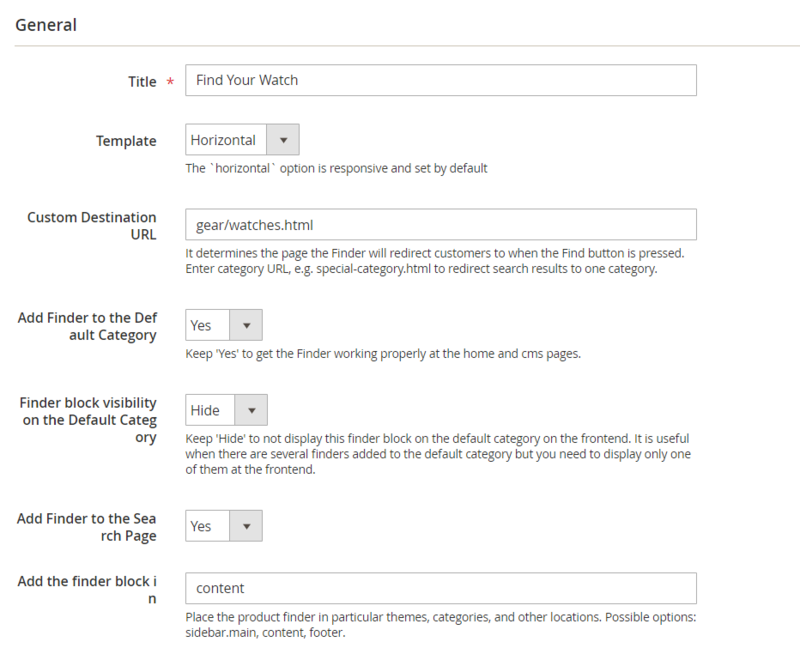 Also, specify in which location the finder will be displayed: the sidebar, content, or footer. The Magento 2 product parts finder module allows selecting multiple categories from the appropriate list. The extension also offers a code for inserting in any CMS page or block and the other one for inserting in the Layout Update XML. In Dropdowns, you have to deal with such parameters as Name, Sort, and Range. Each drop-down has its own set of options. The Products tab of Magento 2 Product Parts Finder contains the grid that shows each parameter from Dropdowns and product SKUs. You can delete each product from the Action column. To upload a new CSV with product data to the Magento 2 product parts finder extension, you only should drag and drop the appropriate file to the Drag & Drop section of the tab. Alternatively, you can browse manually. 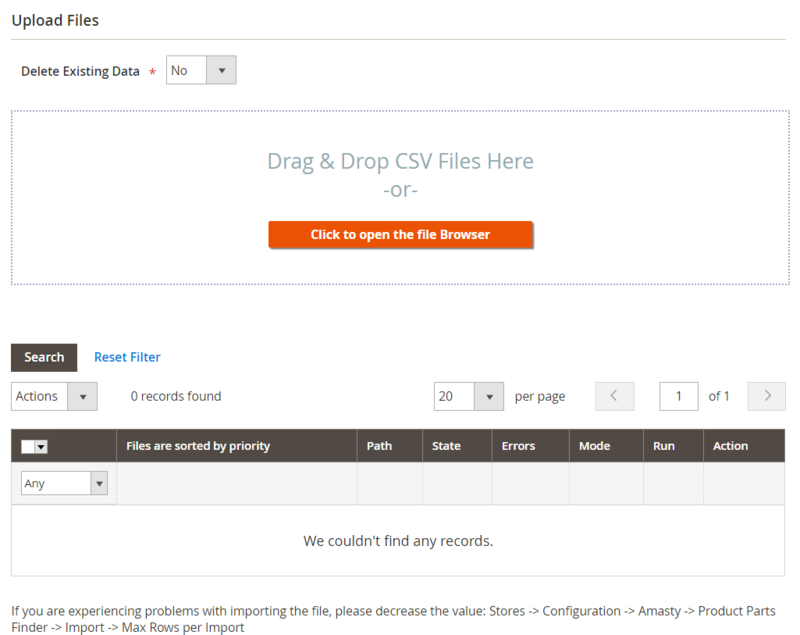 Note that there is an option that lets you delete existing data after a new CSV is uploaded. The Universal Products Import tab of the Magento 2 product parts finder module also lets you delete existing data when uploading a new CSV file. All configuration settings of the Magento 2 product parts finder extension are divided into two sections: General and Import. The first one lets you choose when to display the “Find” button (at least one finder value is selected, or all values are selected), use “universal” products or not (if Yes, choose whether to show them last), apply filter for current or all categories, and add custom destination URL. 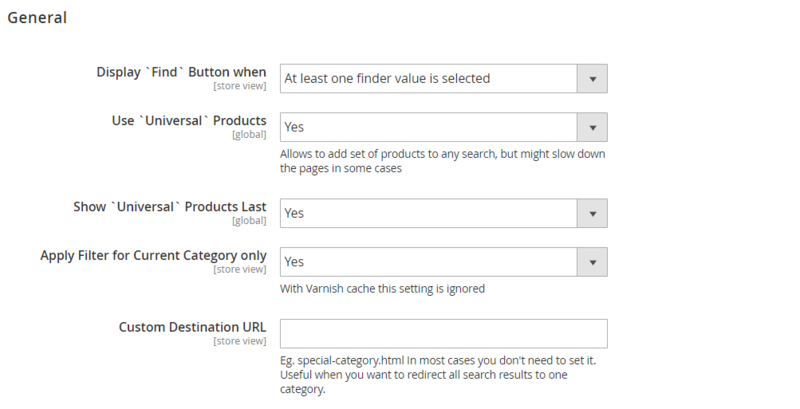 In the same tab, decide whether to activate automatic search when a value in the last drop-down is selected, reset finder (to the home page, same page, or result page), and clear previous finders conditions. Also, here you can set the redirect to a product page for the cases with one item in search results, enable ‘Chosen’ (jQuery) plugin, add compatible options in the separate tab to the product pages after an applied search, and create a title for this tab. In Import settings of the Magento 2 product parts finder module, there are only two options: Import history lifetime (in days) and Max rows per import. Compatibility section is added to product pages to display the items compatible with the finder filter result options. Now the module is compatible with Amasty Improved AJAX Layered Navigation. 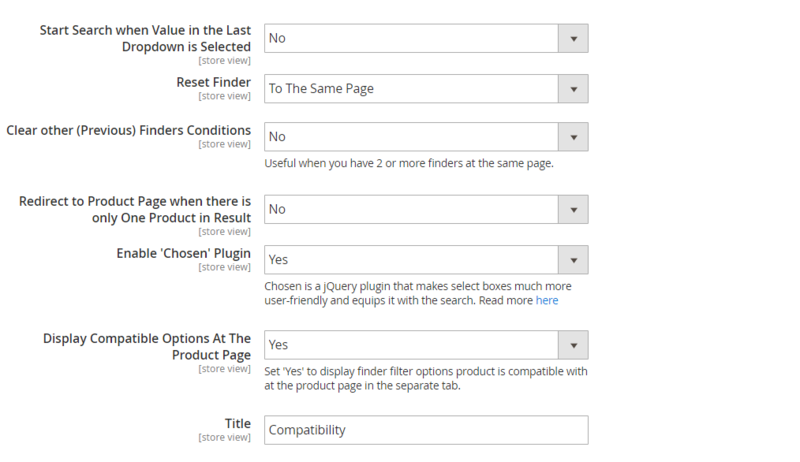 The jQuery plugin is added to make select boxes more user-friendly and use the search field. Now the categories to which the finder is applied can be selected from the list in the backend. 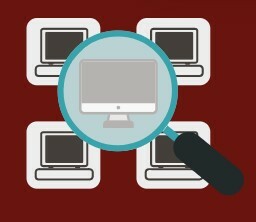 The position of the finder block can be set by admins now. New option: the ability to add the parts finder to the default category automatically. New option: possibility to manage frontend visibility of the parts finder block in the default category. New feature: redirect to a product page in case of only one search result. The ability to show the finder on any page was added. Amasty Product Parts Finder introduces a very important improvement unavailable in the default Magento. If you a looking for the tool that will make the out-of-the-box search more precise, give the Magento 2 product parts finder extension a try: the Magento 2 version costs $199, while for its ancestor Amasty charges only $109.